High levels of vitamin C kill certain kinds of colorectal cancers in cell cultures and mice, according to a new study. The findings suggest that scientists could one day harness vitamin C to develop targeted treatments. Colorectal cancer is the third most-common cancer diagnosed in the United States, with an estimated 93,090 new cases each year. Approximately half of those cases harbor mutations in the KRAS and BRAF genes; these forms of the disease are more aggressive and do not respond well to current therapies or chemotherapy. In a study published in Science (2015; doi:10.1126/science.350.6261.619), a team of researchers from Weill Cornell Medicine, Cold Spring Harbor Laboratory, Tufts Medical Center, Harvard Medical School, and The Johns Hopkins Kimmel Cancer Center found that high doses of vitamin C, roughly equivalent to the levels found in 300 oranges, impaired the growth of KRAS-mutant and BRAF-mutant colorectal tumors in cultured cells and mice. The findings could lead to the development of new treatments and provide critical insights into who would most benefit from them. 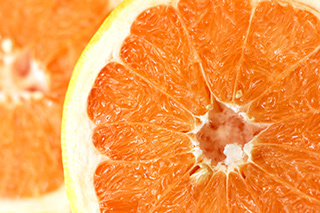 “Our findings provide a mechanistic rationale for exploring the therapeutic use of vitamin C to treat colorectal cancers that carry KRAS or BRAF mutations,” said senior author Lewis Cantley, PhD, the Meyer Director of the Sandra and Edward Meyer Cancer Center and the Margaret and Herman Sokol Professor in Oncology Research at Weill Cornell Medicine in New York, New York. In an oxygen-rich environment such as human arteries, a fraction of vitamin C (ascorbic acid) becomes oxidized and is transformed into a new compound, dehydroascorbic acid (DHA). Scientists have known for some time that the membrane protein glucose transporter GLUT1 enables both glucose and DHA to enter cells, which is an activity not afforded to ascorbic acid. But it was less clear what DHA does once inside the cells. Cantley explained that cancer cells with mutant KRAS and BRAF produce more reactive oxygen species than normal cells, so they need more antioxidants to survive. Therefore, they are far more vulnerable to DHA than normal cells or other types of cancer cells. Cantley cautioned that these results need to be evaluated in the setting of a human clinical trial; however, the preclinical findings may offer a promising new treatment strategy for the KRAS or BRAF forms of the disease, perhaps as part of a combination therapy. The investigators say their study could lead to the development of new biomarkers that could help physicians determine who would most benefit from treatment. These insights may also have implications for other hard-to-treat cancers that express high levels of GLUT1 transporter, such as renal cell carcinoma, bladder cancer, and pancreatic cancer. “This is not a therapy that you would want to wander into blindly without knowledge of what is going on in your tumor,” Cantley added.